I belong to a local ICES group which stands for International Cake Exploration Society. 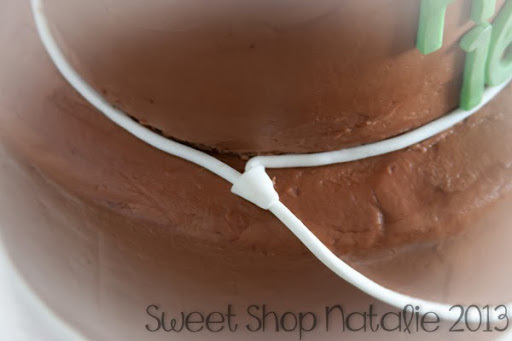 I joined the group to learn more about making cakes and making friends who love to play in sugar like me. 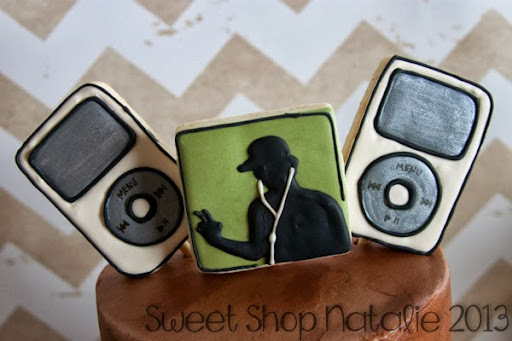 Cookies by far are the thing I enjoy doing and I dabble in cakes here and there. Well Icing Smiles contacted this group I belong to and asked for a volunteer to make a cake for a brother of a boy who is suffering from Leukemia. No one else said they were available so I said I would do it. Icing Smiles is a nonprofit organization that provides custom celebration cakes and other treats to families impacted by the critical illness of a child. This is actually a awesome opportunity and I was happy to be able to help out this family who is going through a very rough patch in their lives. 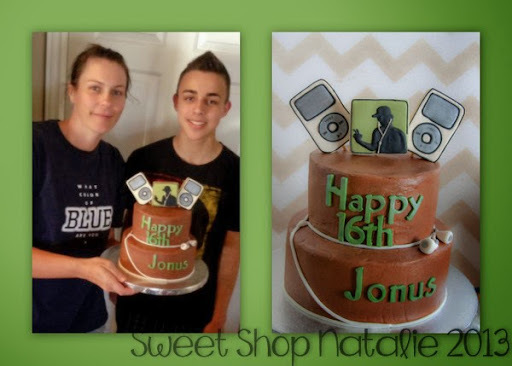 The cake I was to make was for a 16 year old boy named Jonus. His mother told me he loved his iPod, headphones etc.. 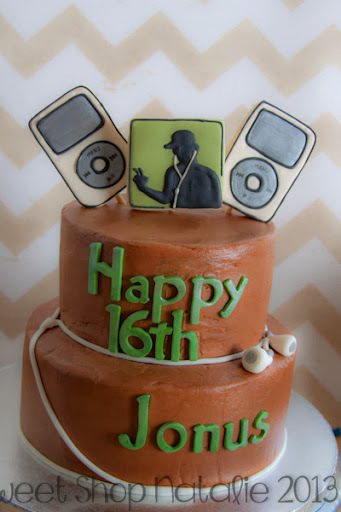 I originally was going to just do a rectangle cake in the shape of an iPod because I thought it would be simple. 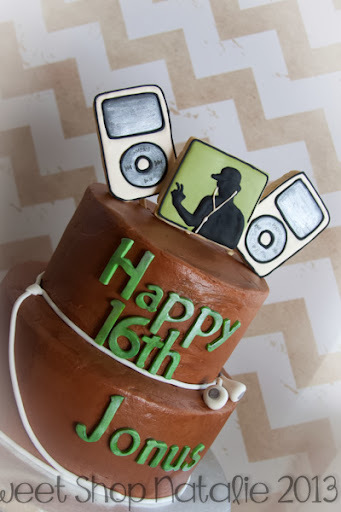 But I really want to put in some cookies so I took even a little bit of easier route and made a chocolate cake with chocolate butter-cream and topped it off with some iPod and a teenager listening to some tunes! It was a little rough making the cake because the filling I had made failed and I had to completely start over on the bottom tier. Luckily I was able to recover and get it done on time. 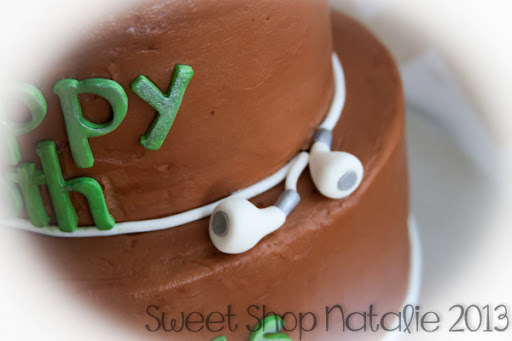 Lately I don't really love covering cakes in fondant but I did make some ear buds out of it to be the border of the cake. His whole family came by to pick up the cake so I go to meet his parents his younger sister and his little brother who has Lukemia. I really felt so good to be able to provide this service for their family and I hope that the chocolate cake brought a smile to their faces. If you want to learn more about the Icing Smiles organization please click here. You don't have to be a business to volunteer to those who need these services. This is a country wide organization and they are always looking for some one to donate their time and talents to help those who are suffering from a critical illness.